For my second Graphic Narrative assignment under Prof. Lauren Redniss, I was challenged to come up with a graphic narrative experimenting with the notion of “night” or the “nocturnal” using a subtractive medium. After coming up with multiple sketch ideas, I chose to base my final comic on the idea of the word “Mangata”, which is an untranslatable Swedish word that denotes the road like reflection of the moon’s light on a calm body of water. 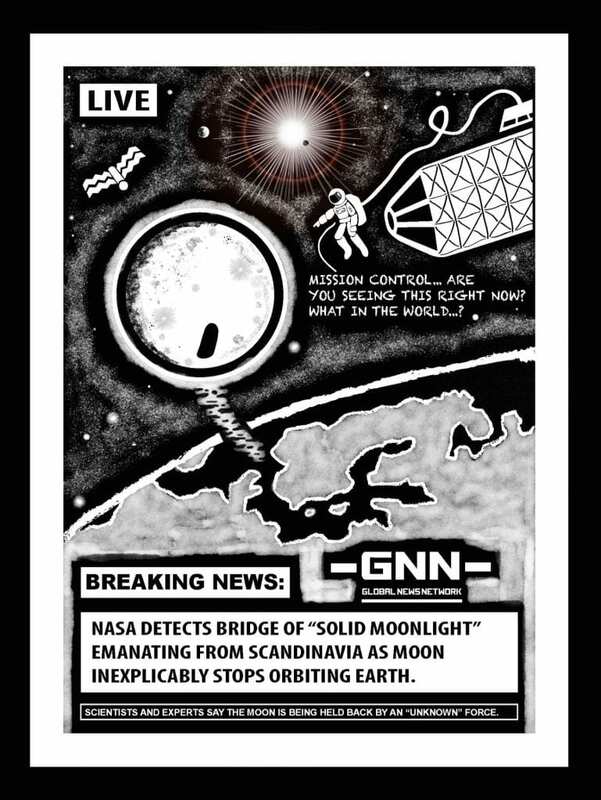 The graphic narrative expresses the idea of a “mangata” literally, opening up with an actual road to the Moon appearing in Scandinavia that will allow people to go to the Moon seemingly without the use of rockets or astronaut suits (magic). The graphics were made in black and white vectors and paintbrushes on purpose, so they could be engraved properly afterwards. I specifically used a preset of special paintbrushes from a professional designer who got his brushes placed into Photoshop as an add-on in order to get the nebular starry effect in all the panels, and used the flare tool for the Sun in the third panel. 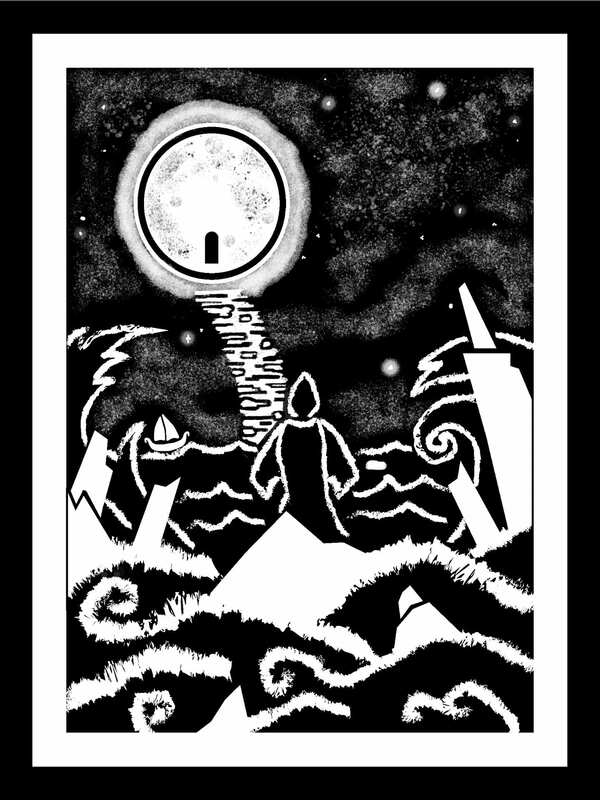 In the first panel, the mistress or goddess of the Moon and the night creates the road to the Moon and moves the Moon much closer to Earth, causing the tides on the planet’s surface to intensify. 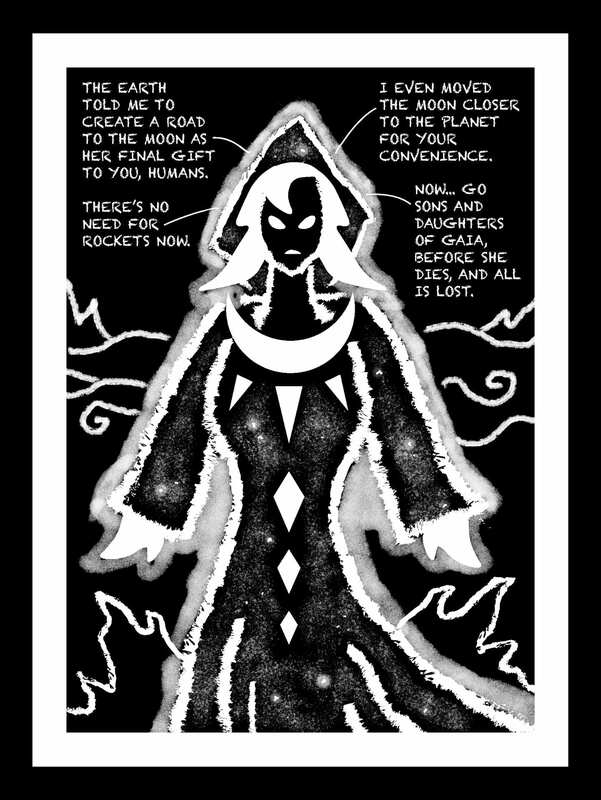 The second panel reveals how the goddess looks like and her reasons for doing what she has done– Gaia, or Mother Earth told her to create the Mangata as a selfless final gift to humanity so that we may be able to start all over and live on the Moon in order to escape the ecological and environmental degradation of the planet we ruined. Nature, and Earth herself is dying, and those that will escape will be those in Scandinavia who have pursued policies of peace and environmentalism, not war and industrialization at the expense of the natural order. The third panel of the narrative shows the human reaction to the movement of the Moon in the form of a news report taken live from the perspective of a satellite or astronauts orbiting Earth. NASA detects the Moon’s motion towards Earth and the bridge of “solid moonlight” formed by the moon goddess. NASA’s announcement is then broadcast on the Global News Network (not just a spoof of CNN, but also implicative of a world government with a news agency of its own). The viewer is then left with a looming sense of anxiety or panic much like those watching the news in this alternate world– the Earth is not only at the brink of collapse, but now the Moon is closer to the planet than it should be. I originally planned on engraving the designs I did on Photoshop and Illustrator (with a mix of special paintbrushes, and vector shapes) onto some scrap wood that I found at the Making Center (and cut into rectangular pieces), but found little time to actually go to the Laser Lab for the engraving process. On top of that, the wood I used ended up being toxic when laser cut, and I was told I had to use another material to avoid risking my own health and that of other people using the machines. 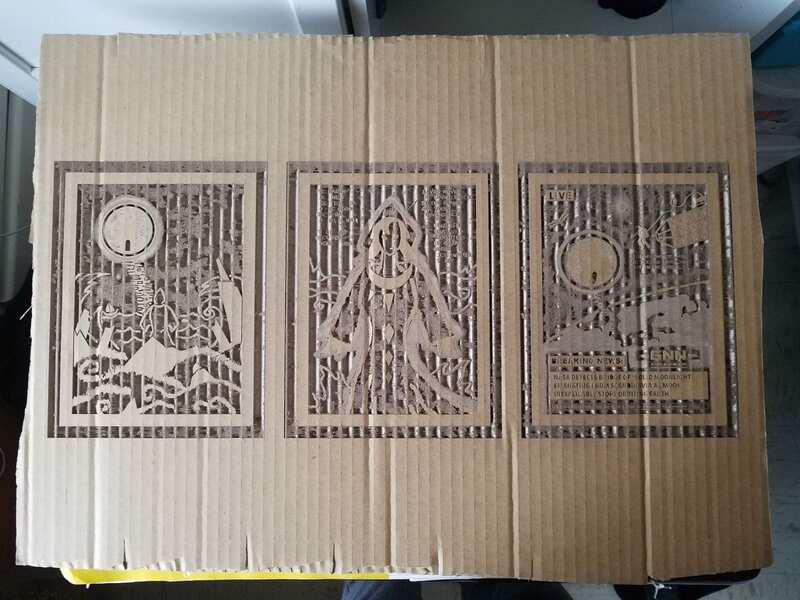 I happened to find a spare piece of cardboard in the scrap shelves near the Laser Lab rooms, so I went ahead and improvised, engraving all three of my designs on the cardboard.